Paul Pogba marked his return to Manchester United after four years at Juventus by coming straight into the side replacing Ander Herrera in an otherwise-unchanged lineup in Mourinho’s first game at Old Trafford. Southampton lined up in a 442 with a midfield diamond tipped by Dusan Tadic with Redmond and Long both alternating between staying on the shoulders of the centerbacks and spreading wide for passes down the wing. 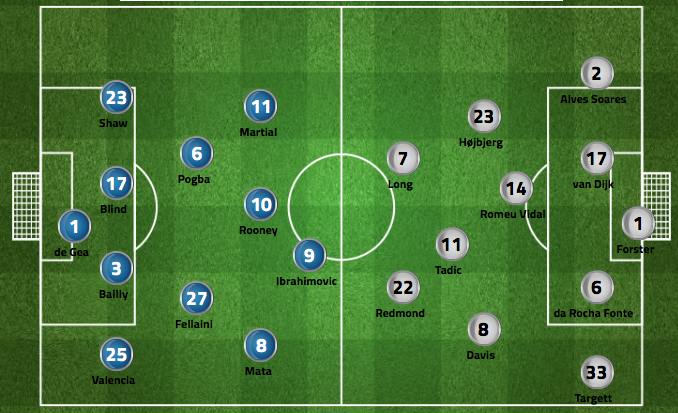 Pogba preferred position on the left-handed side of midfield meant that Fellaini moved to the right side of midfield. Rooney and Ibrahimovic continued to altnerate dropping back into midfield for possession, with Rooney showing a tendency to move more laterally. While it would have been difficult to imagine at the beginning of the summer that Fellaini and Mata would be in Mourinho’s first team, Pogba’s arrival means that the team is at full strength and a clearer picture of the team’s style of play is becoming evident. Perhaps Pogba’s greatest strength as a player is that he has so many, and in this game his defensive sensibilities, range of passing, physicality, dribbling, and pace were all on display. Pogba’s diverse skill set allows him to perform many different functions within a team selection and for United this seems to be particularly useful in terms of shutting down opponent attacks and then swiftly transitioning into attack in such a way that allows United to counterattack without building through the midfield and fullbacks, allowing Fellaini and one of Shaw and Valencia to stay back for greater defensive security. 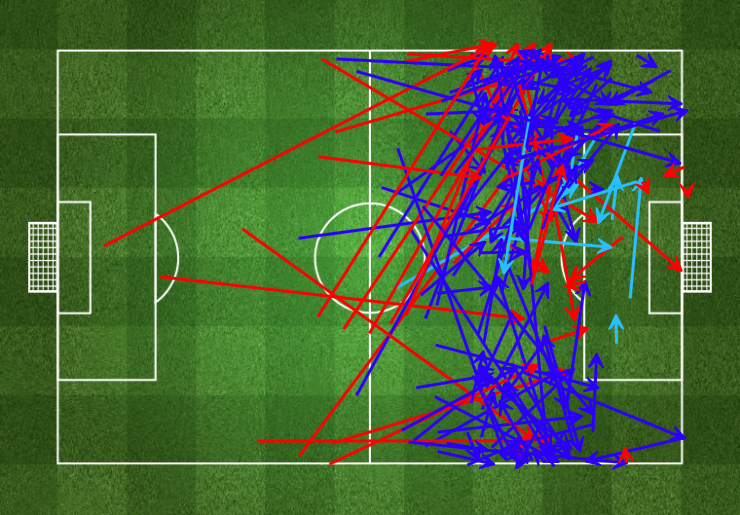 United had 43% possession to Southampton’s 57% but never felt particularly bothered. Frequently Southampton would lose the ball in United’s defensive third and Pogba would be able to resist Southampton’s counterpress and either dribble through Southampton’s lines to drive forward, or switch the play into space to an onrushing winger or fullback. Against Bournemouth last week the small size and lack of ball-playing skills of Herrera and Fellaini respectively forced them to take several small passes to clear the ball from Bournemouth’s counter press which cost valuable time and allowed Bournemouth to get back into a defensive shape. Pogba’s ability to resist Southampton’s press and quickly restart the attack is evident in this video below. Southampton’s diamond (a rarely-scene midfield shape in the Premiership) gave them good control of the midfield and allowed them to retain possession and frequently find space between the center backs and fullbacks in the half spaces when attacking United. Despite his size, Fellaini’s truthfully spent most of his career as an attacking player and while Pogba has good defensive instincts, his responsibilities to also join the attack will leave him frequently out of position (though his athleticism typically allows him to get back quickly). The attacking third passing maps showpassing spreads for Southampton and Manchester United that are frequently seen by Mourinho-managed teams in games against top-level competition. 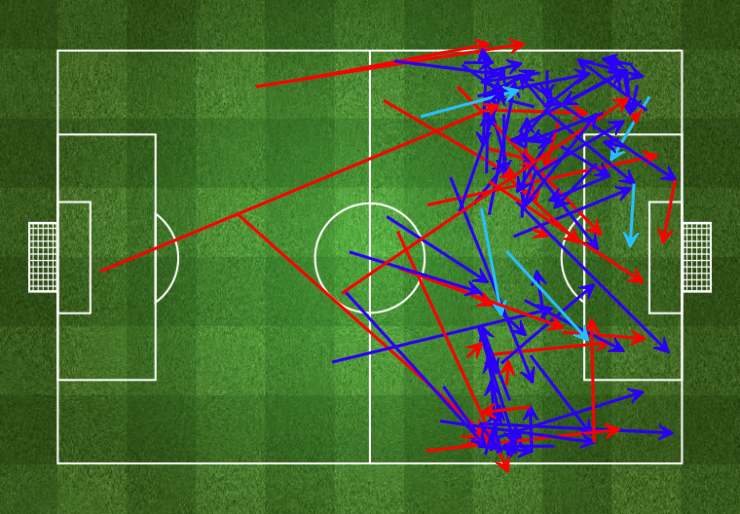 For Southampton, notice the huge amount of passing just outside the box, particularly on the wings and half spaces. United seemed more than happy to let them linger there, but were then also able to limit Southampton from passing into the box for more incisive chances. United’s attacking third map looks like a characteristic Mourinho counter-attacking team, with not nearly as much amount of possession in the attacking third as Southampton, but when they did get the ball into those areas, United used a lot of vertical passes into the box at longer distances, which would evidence a speed of attack that Mourinho’s Real Madrid and Inter sides were particularly succesful with. In a game under LVG last season, one would expect these pass maps to be reversed, so Mourinho’s style is already being seen in small ways. In the last five years, the weaker teams in the premiership have been becoming more possession-reliant than they have historically, with Swansea, Bournemouth, Southampton, Middlesborough all playing with possession quite comfortably. One suspects that moving forward, Mourinho’s counterattacking team will be well suited against these sides as well as the traditional possession-reliant powers like Manchester City, Arsenal, and Tottenham. But of course old Premiership speed in attack on the wings still can be effective as Leicester’s coronation last year proved, and it will be key to see how Mourinho’s team attempts to break down lineups which are more than happy to sit back and defend before attacking on the break. Next’s week game against Hull will likely be the first test in that regard.